Many thanks for that update. Very interesting! The government are run by the ansbacher account holders, and the Fine Gael Landlords Association. So basically the government has to recognise that global warming is taking place and that it is imperative that all steps are taken to reduce levels of GHG. Once that policy is in place, costs will be a secondary issue compared to the environment and wind farms will be irresistable. Ireland and the EU are likely to meet their targets for greenhouse gas emissions. Regulation is thus adequate. The fact that the permit price is low is not a sign of dysfunctionality. On the contrary. There is oversupply. The price is low. The market works, so. We should be happy that we can meet our targets at such a low cost. Many people would argue that the price of electricity is high enough as it is. Besides, under the rules of the EU ETS, wind power in Ireland does not reduce carbon dioxide emissions, because the cap is set independently. I welcome the re-opening of this debate. Where can I find an indication of how much the expansion of wind power is costing us in subsidies (ignoring environmental issues for the moment)? That is exactly the point. It is very hard to compute that, and the people who have the right information have yet to do this. There are three complications. First, REFIT is a price guarantee rather than a subsidy. If the wholesale price is above 7 c/KWh, there is no subsidy. If the price is below, the difference will be made good through a Public Service Obligation. The accounting is murky, and complicated by its impact on interest rates. Second, wind imposes pecuniary and non-pecuniary externalities on other power suppliers. This implies lower profits and accelerated depreciation for companies that are largely state-owned. Third, a substantial part of grid reinforcements, interconnection, reserve and spinning capacity, and frequency regulators are because of wind. Such items appear on the balance sheet of ESB and EirGrid but are not attributed to wind even though they should. These sums could have been paid to the exchequer as dividends. Eleanor Denny bravely attempted to quantify some of this stuff. Feck,* I completely missed this part of the debate on Saturday. As the Americans would say – a do-over required. *does that count as unparliamentary language or affectionate slang post Fr. Ted? The amount of permits issues exactly equals the amount of permits issued by the European Union. The problem is that the EU believed in its own forecasts of rapid economic growth. Is Pat Swords a particularly committed individual or is someone behind him ? Does he believe we should do nothing for 50 years since the costs of doing something are too high ? The Irish government took a very prescient decision not to carry out a rigorous assessment in advance prior to adopting NREAP ~ 37% wind power target. Such a study would have demonstrated that the policy makes no sense. As well as loss of face, this might have embarrassed the Irish government into questioning EU renewables policy openly. Questioning the wisdom of any EU policy was taboo at the time. For rational non-ideological people, renewable energy is not an end in itself. It is supposed to deliver specific environmental and/or societal benefits – lower prices for electricity or at the very least a low cost route to emissions reductions, energy security etc. In reality, it is not doing these things. I disagree with Professor Tol about lack of data in Ireland. In fact, it is not appreciated here, but Ireland has been more open than anyone else in putting very detailed information into the public domain. This is a reason (along with high wind penetration) that we are at the epicenter of international concerns about the scale of investment in wind power. Anyone who has looked at the data seriously knows that wind power is leading to less CO2 savings than were anticipated (even compared to the pessimistic ESB 2004 report). Savings are ~ 0.28tCO2/MWh (and falling). This compares with grid average emissions of ~ 0.48tCO2/MWh or peat plant emissions ~ 1tCO2/MWh. Emissions reductions costs (€/tCO2) are correspondingly higher than anyone anticipated. Pat Swords’ case has the potential to save Irish consumers and taxpayers billions of euros. So why is our own government trying to stop him? How big a part will fracking play in Irish energy policy over the next 30 years? An electricity supply made up of say 50% domestically produced wind and 50% domestically produced gas seems like a pretty good split from an economic point of view. Increases in the price of electricity from additional wind could be offset by the cheap (?) gas supply and it would obviate the need for imports. Ideally, this scenario would persist from say 2020 to 2050 by which time we will have invested nuclear fusion! I don’t know how realistic that solution is (fracking, not fusion!). Even if we assume that fracking could produce enough gas for such a solution to be viable, would the environmental cost be too great? If Shell to Sea is anything to go by, it would not be easy to begin fracking in Ireland in any event. The protest movement would be huge I imagine. To play Devil’s advocate; Is it as adequate as horse-meat regulation in the EU? It is adequate in that we’ll meet the targets. I think we’ll meet the targets without large scale fraud. Although the EU ETS is designed to invite such fraud, I think that that will not manifest itself until after 2020. Would have to agree with the sentiments expressed by Richard at the top of this post. On a slightly different question – the proposed wind turbines are very large. Does anyone have any design details? The blades will be very long. The tip speed and their vortices are a significant source of noise (without limitations the tip could approach the speed of sound for example – so this is a standard design limitation), and gusting of the wind raises the angle of attack sometimes causing intermittent stall-out. Are there any tip speed limitations likely to be imposed by the state or is it likely to be left up to the manufacturer? Design preference is likely to be for higher rather than lower rotational speeds. Is there a link to a Noddy’s Guide to said potential fraud you could furnish us with? “The Irish government cannot justify policy decisions with a few half-baked arguments and ram it through the Dail.” I’m afraid that’s exactly what they do, ALL the time, because of our ‘winner takes all’ parliamentary system. Every government party deputy is pledged to support government proposals or ‘lose the whip’ and be cast into political no man’s land. And when, as at the present time, a government has a massive parliamentary majority at its command, they can afford to lose a few ‘dissenters’ without threatening their majority and so tend to do as they like. Irish governments always threaten litigants with costs, mainly it seems as a means of deterring them from pursuing legal actions that question government policy. There’s no ‘morality’ attaching to it, irrespective of how appalled public opinion may be. It’s just what they do. Indeed in the case involving the late Mrs Brigid McCole and the blood contamination scandal of the 1990s, the threat of pursuing her, and her family, for costs in the event of her losing a court action against the state seeking disclosure of how and when the blood supply had become contaminated, almost led to the undoing of the political career of the then Minister for Health, Michael Noonan. Later, as he acknowledged to his party conference in 2002, legal advice had gotten in the way of personal judgement. Subsidising wind is a story about the success of the wind lobby, and is not related to reducing carbon emissions. Wind is not a carbon reducing technology within the EU. Power generation is in the EU-ETS so any reductions in carbon from wind displacing thermal generation will result in the right to emit carbon being sold to other emitters. The intention is that the overall EU ETS determines a price for carbon and hence achieve the target carbon levels at least cost. Arguably, the targets could be lower and more sectors could be added to the EUETS. Removing carbon from the debate should make it clear is that the subsidy is required simply to reach renewable energy targets. Wind subsidy is purely a national public policy choice which is worth debating as it has substantial costs for the consumer. Good luck Pat. That’s just the point – it’s all about carbon, otherwise Mr ‘Hill’ wouldn’t be promoting this individual – and Mr. Tol wouldn’t have added the *second* link in a few days to the same damned rticle (it seems that the IE owners are perfectly fine with this continued use of the blog as a personal hobbyhorse by one contributor). That’s a good question, that perhaps Pat Swords can answer here rather than over [NEEDLESS INSULT]. There appears to be a wierd concensus that wind does not reduce carbon emissions. Pat Swords quixotic campaign against windmills is fine if it will lead to more info for the public generally but the big picture is that the planet is still heating up and we need to take every step we can to slow that down. Weird is right. Now, let me explain about the manufacture, installation and maintenance of ‘windmills’. Ah! Now we’re sucking diesel! Forget the damn emissions or environmental considerations. We need to consume energy or our societies decay. And its the quality of that energy, its power density and its geographical footprint that matter. As I mentioned to EWI in another post – most folk (and especially some journalists) are clueless about energy provision and generation. But they sure can write good copy! There are absolute, immutable natural laws out there. Nature IS! And humans are a tad shocked to constantly re-discover that you cannot finesse these laws – ever! So, ‘carry-on-regardless’. Weird! There may be problems with wind energy, but we shouldn’t forget the big picture. Fossil fuels are finite, therefore at some point we need to move onto renewable energy. It would seem we haven’t worked out how to do this entirely yet with issues including intermittency and the not to be underestimtated difficulty in producing sufficient quantities of energy from renewable sources (see David JC Mackay’s book for the UK – the situation is probably rosier for Ireland with reduced population density). It may cost us money, even lots of money in the short to medium term to ramp up our renewable capacity, however it is something we must do if we want energy in the future. Therefore issues such as possibly excessive subsidies are merely obstacles that must be overcome rather than things that should move us away from renewable energy. Sure will Colm. But money is fiat stuff. No problemo there! Just ramp up those printing presses. Inflation is good. But just do not attempt this with energy stuff. You’ll get a very unpleasant shock! Never mind the quantity – just feel the quality! And make sure it is not the live phase you are touching! As I said above, us humans are in for a nasty surprise in respect of our energy requirements and how we will provide ourselves with the quality, in the quantities needed. It not funny anymore. Basically our politicians are either lying to us about the critical nature of energy to a economy based on a ‘growth’ paradigm or they are clueless. The latter looks promising. Ireland has no choice but to promote renewable energy development as it is legally obliged by the Renewables Directive 2009 to increase the share of its energy derived from renewables five-fold between 2005 and 2020. We should of course find the cheapest way to meet this binding target. Onshore wind is particularly suited to Ireland given our land availability and wind speeds – but the decision to promote onshore wind over say biomass, biogas or tidal should be justified. This is not the view of the EPA which is the body officially charged with collecting and monitoring air emissions. The EPA’s latest assessment is that Ireland will breach its emission limits within 3 years leaving us open to to charges of up to €300m to comply with our enforceable emissions obligations. You have not been paying attention. Pat Swords contention is that NREAP is illegal because the necessary strategic assessments were never done. If he is correct, it is the mindless implementation of “renewables targets” which is illegal, and not the other way around. I agree, the case is about the process of choosing how to support renewables (and which to support) to meet the target and not the policy of meeting the target itself. This paper from 2011 concludes that onshore wind is likely the cheapest option to meet Ireland’s renewables obligations. At some point we need to start thinking about all the resources we waste. It is very unlikely we’ll be able to replace oil’s capacity with that of renewables but we can cut out a lot of the sh*te that forms such an important part of our economic model. Throwing away packaging and bottles after one use is insane. Dumping computers and mobiles after 18 months is nuts. Fishing for certain species and dredging up unwanted fish and throwing them back dead is for the birds. Its not unlikely. Its a ‘slam dunk’ physical chemistry fact that re-usables (or whatever) cannot ever replace oil/coal. These two (along with gas) are energy dense, highly reduced primary, low-geographical footprint sources. The others are less energy dense, less reduced, high geographical footprint secondaries – they need coal/oil/gas to ‘boost’ them up to usable levels. They may fill a niche gap, but that’s it. Period! As I mentioned above, we will surely find out this the ‘hard way’. If we forget about the consequences of our emissions and environmental considerations our societies are doomed. @ fergaloh: Thanks. Tongue very firmly in cheek there! Many individual folk (me also) are VERY concerned about the environmental consequences of the ‘dash-for-gas’, windfarms and biofuels. Its utter madness, but sure that never deterred the masses of sheeple who, whilst not fools, are behaving very foolishly. May change. Hope it does change. It doesn’t look great really, does it ? I think I’ll follow Prof Tol and think that it is much cheaper to do nothing and maybe everything will be grond . I went to a talk last year about electric car use in Switzerland. 1. There aren’t enough resources in the world to facilitate a switch to renewables. 2. Nothing is as efficient energy wise or as dangerous climate wise as oil. 3. The road system developed assuming that the oil would pump forever and that external costs were irrelevant . 4. We’re caught in a trap. I wouldnt disagree with the article, wind probably reduces carbon emissions in the electricity sector. The EUETS reduces carbon, not NREAP. It seems reasonable that we should audit the statement: “We are all doomed”. Public policy on carbon dioxide emissions in the EU is based on models. Many of them experimental and incomplete. Unaudited models. Models that are not working, based on actual data on the climate over the last 13-15 years. You would think that, if they turn out to be wrong, there would be sighs of relief and we could decide to ease back on the very tough targets set for the reduction of emissions. Reductions that if implemented fully will expand poverty throughout the EU, hardly the objectives of our founding fathers. Instead we find Emissions Policy steaming right along without any attempt to update or refine the implications. Meanwhile China and India increase emissions monthly equivalent to that which Ireland must save by 2020, or face fines. So where is this policy taking us – clearly it is not saving the planet, it is just impoverishing us. fergaloh is completely wrong. 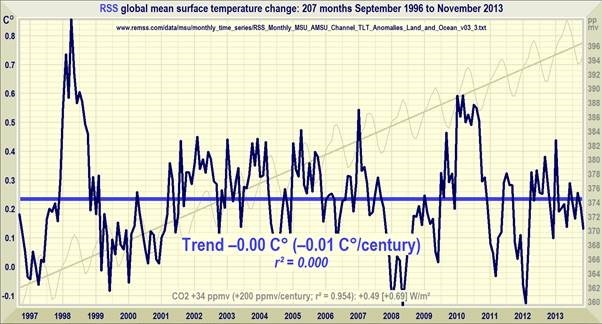 The planet’s atmosphere is not warming up and has not warmed up for over 17 years. Check the link below.